And you are right! It is Tuesday and I don’t usually publish a post on Tuesday, but I didn’t want to make people wait an extra day for Víctor here. He’s the companion to Yumiko’s sundress on Monday. 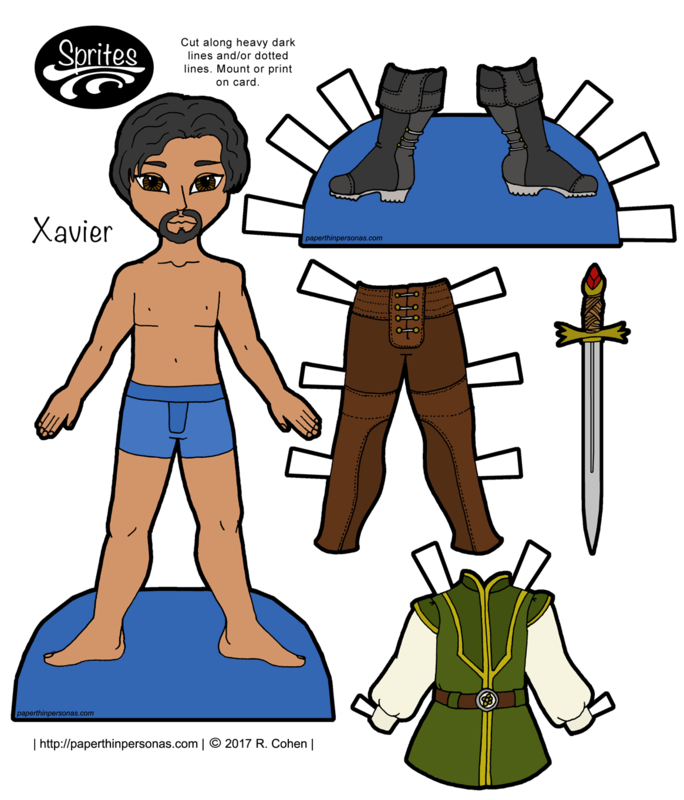 Víctor’s not gotten much paper doll love this year. He’s not had a new paper doll set since 2016 and that was when he was busy being the Mad Hatter. I tend to pick Sprites based on “which one haven’t I done in a while?” which isn’t the most scientific method, but there you go. Designing contemporary men’s clothing can be very challenging for me. Since I work on a college campus, I try to notice what the students are wearing. Despite subscribing to several fashion magazines, nothing beats seeing fashion in the wild. One thing I have noticed lately is the skinny jeans are being worn by the guys as well as the ladies. So, when I was deciding what I wanted to create modern paper doll fashions for Víctor, my Latino Sprite gent, I knew I wanted to include skinny jeans. I’ve also noticed that colored jeans are being worn by guys, though mostly just greys and browns. I did see purple ones for sale, but I suspect purple jeans for college boys are an outlier. I chose the grey and yellow color scheme as a companion for Yumiko’s purple and yellow dress. I wanted it to coordinate, but not really match. The rest of the week will post as normal. 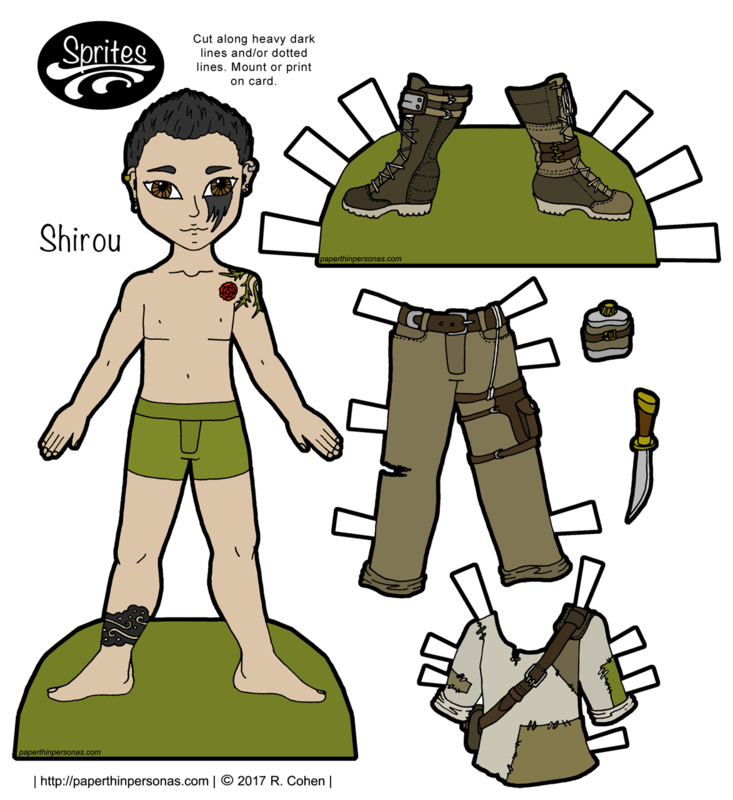 As anyone whose been following this blog for a while knows, I have mixed feelings about men’s clothing and male paper dolls in general. I am trying to learn to embrace the things that male paper dolls have that lady paper dolls don’t have. One of those things is facial hair. So, today I am experimenting with facial hair by giving Xavier this dashing goatee. 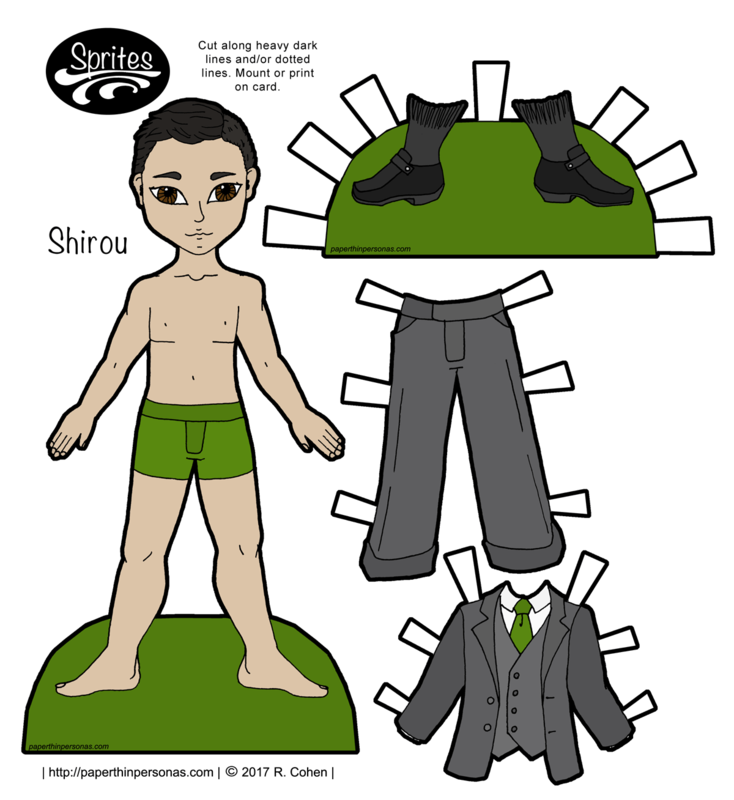 Of course, I have to remind myself that not every paper doll has to be perfect. Perfect, I often say, is the enemy of Good. Frankly, my favorite part of today’s paper doll is the sword. I think that came out pretty well. If you want to give Xavier some other fantasy clothing I think this set or this set would look pretty cool.